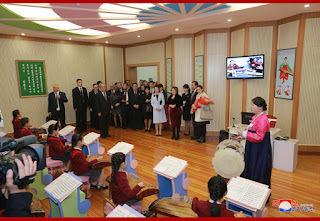 Pyongyang, November 5 (KCNA) -- Wife of the president of the Council of State and president of the Council of Ministers of the Republic of Cuba Lis Cuesta Perasa visited the Mangyongdae Schoolchildren's Palace on Sunday. 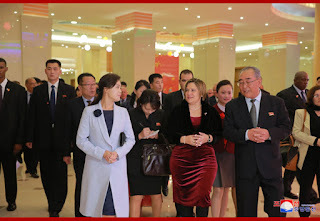 She was accompanied by Ri Sol Ju, wife of the chairman of the State Affairs Commission of the DPRK. Lis Cuesta Perasa and her party were warmly greeted by Choe Hwi, vice-chairman of the Central Committee of the Workers' Party of Korea, and officials of the palace. Teachers of the palace and schoolchildren warmly welcomed the wife of the Cuban president, presenting a bouquet to her.